Another one I got on the day it was released. Can I come out with quite a portentous statement? 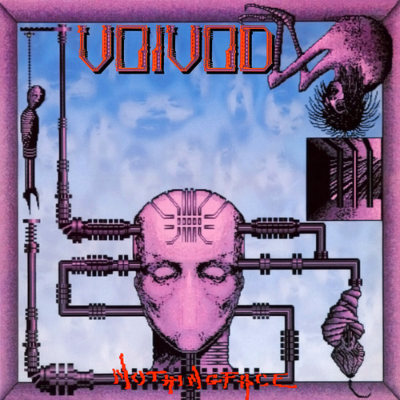 I genuinely believe that no one gets Voivod the way I do, and that includes the band themselves. Voivod did something funny to me. From Killing Technology through to Angel Rat, they had this run, of which Nothingface is the pinnacle. I can't think of any other band that was so relentlessly committed to the tritone - the flattened fifth, the Devil's interval. It's this strange chord that sounds immediately otherworldly and bizarre and not right and beautiful. Voivod made it their standard chord. In every single song in this period, the standard barre chord is the tritone. It just creates such unusual tensions and atmospheres. The songwriting's incredible, the arrangements are amazing - unfortunately the production has aged it a bit, but so be it - but what makes Nothingface so special is that "Snake" [Denis Bélanger]'s voice really comes into its own. He really starts singing on this record. And they're pop tunes, made out of this triton, with lyrics that sound like they're written by some beatnik scientist. Every line is brilliant. Again, the whole thing exists in this funny, squared-off Voivod universe. It's just one of those records when, as soon as I heard it, I just thought, "This is for me, this is where I'm at." Even now, I hear traces of things that I do that come straight from Voivod.